352 pages | 1 B/W Illus. 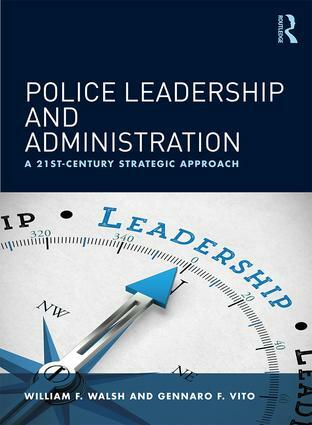 William Walsh and Gennaro Vito have adapted the strategic management process to the police organizational world in this innovative new text, Police Leadership and Administration: A 21st-Century Approach. Focusing principally on the police executive, this book covers pioneering management techniques for leaders facing the challenges of today’s complex environment, providing the police practitioner instruction in planning, setting direction, developing strategy, assessing internal and external environments, creating learning organizations, and managing and evaluating the change process. It also tackles how to handle the political, economic, social, and technical considerations that differ from one community to the next. Police Leadership and Administration trains individuals to search for solutions, rather than relying on old formulas and scientific management principles. It shows how to tailor responses to the unique problems and issues that professionals are likely to face in the field of law enforcement, providing a foundation with which to adapt to an ever-changing criminal justice climate. This book is essential for forward-thinking police leadership courses in colleges and professional training programs. William F. Walsh is the former Director of the Southern Police Institute and Professor Emeritus in the Department of Criminal Justice. He holds a BA in Behavioral Science, an MA in Criminal Justice from John Jay College of Criminal Justice, and a Ph.D. in Sociology from Fordham University. A former Lieutenant with the New York City Police Department with 21 years of service, he has conducted research on police and security issues, and authored several articles in scholarly journals, monographs, book chapters and books on police administration, supervision, and management. Before joining the University of Louisville, he served on the Administration of Justice Faculty at The Pennsylvania State University, where he received the National Continuing Education Association Faculty Service Award in 1988. He has been a consultant to numerous United States law enforcement agencies and the national police forces of Hungary and Romania. The Academy of Criminal Justices Sciences awarded him the OW. Wilson Award for his outstanding contributions to police education, research, and practice in 1999. In 2003, he received the Governor’s Award for his contributions to Kentucky law enforcement. He was awarded the Melvin Shein Award by the Kentucky Law Enforcement Council in 2004 for Distinguished Service to the Kentucky Police Community. In 2006, he was named the first recipient of the James J. Fyfe Award for a lifetime of service and scholarship to the law enforcement profession by the Police Partnership of New York City.In 2008, Mayor Jerry E. Abramson of the city of Louisville, Kentucky, presented him with the Community Partnership Award for his services to the Louisville Metro Police Department. Gennaro F. Vito is a Professor in the Department of Criminal Justice at the University of Louisville. He also serves as a faculty member in the Administrative Officer’s Course at the Southern Police Institute. He holds a Ph.D. in Public Administration from The Ohio State University. Active in professional organizations, he is a past President and Fellow of the Academy of Criminal Justice Sciences and recipient of its Bruce Smith Award in recognition of outstanding contributions to criminal justice as an academic or professional. He is also the recipient of the following awards: Educator of the Year Award from the Southern Criminal Justice Association (1991), the Dean’s Outstanding Performance Award for Research and Scholarly Activities from the former College of Urban and Public Affairs at University of Louisville (1990), the Dean’s Award for Outstanding Research from the College of Arts and Sciences, the President’s Distinguished Faculty Award for Excellence in Research (2002), and as a Distinguished University Scholar (2008). He is the author of more than 100 professional, refereed journal articles (in such journals as Criminology, The Journal of Criminal Law and Criminology, Justice Quarterly, Police Quarterly, and The Prison Journal) and more than 50 technical research reports. He has published on topics including capital sentencing, police consolidation, police traffic stops, policing strategies for drug problems in public housing, attitudes toward capital punishment, and the effectiveness of criminal justice programs, such as drug elimination programs, drug courts, and drug testing of probationers and parolees. He has made more than 100 presentations at professional meetings, including the American Correctional Association, the International Community Corrections Association, and the Kentucky Bar Association. He is to co-author of nine textbooks in criminal justice and criminology.